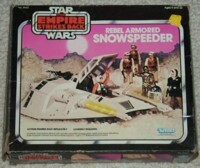 "Authentic rebel vehicle used to defend the secret Rebel Ice-Planet Base. Cockpit opens to hold two Action Figures back to back. Press the button and landing gear comes down. 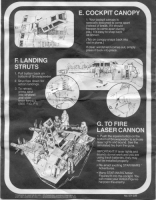 Laser cannons light up, and emit a "battle sound." 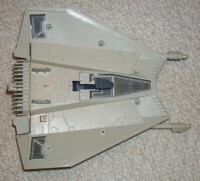 Harpoon is removable and comes with a two foot string to capture the AT-AT." 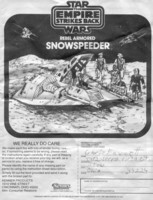 The Snowspeeder was the first ship to incorporate sound other than the standard "laser" of the X-Wing and TIE Fighter. 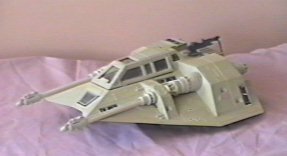 Instead of the single LED weapons system of previous releases, the Snowspeeder featured lights along the side of each laser cannon. When the fire button is pressed, both lights and sound pulsate. 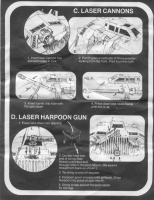 The gun on the rear of the Snowspeeder came with a detachable harpoon connected to a two-foot string. This string is connected to a plastic "anchor" that fits into the back of the vehicle. 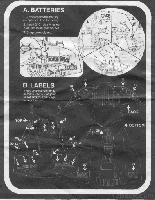 The whole assembly is easily removed (for "capturing AT-AT's") and is the most frequently lost part on this vehicle. Button-activated laser sound. The sound (and light along sides of cannons) pulsates. Front landing gear spring loaded. When retracted, the skid is held in place by a sliding retainer. When the retainer is pulled slightly to the rear, the skid pops out. Rear (harpoon) gun swivels and has detachable harpoon. 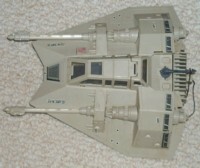 Canopy opens and cockpit has seating for two action figures.